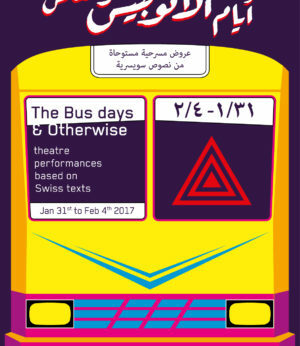 Swiss text “Yellow Days” written by Daniela Janjic between 2005 and 2006 will be performed for the second time in Cairo. This time, the text was adapted and directed by Egyptian theater director Ashraf Sanad, and will be performed for 15 nights at Al Hanager Arts Center, starting January 26, 2018. The performance will run every day (except Mondays) at 8 PM. In “Gelbe Tage” (Yellow days), the war has already begun before it breaks out: despite her brother’s warnings, the woman is with a man who belongs with “the others”. His faith and his origins make him a stranger. However, the ideal of different ethnic groups living together peacefully still appears to be intact. At worst, aggression explodes whilst playing football. They even unite when a third party attacks. Husband and brother fight the enemy together, forcing him to retreat. Yet, winning is not followed by reconciliation: the conflict is now in the open and is continued within this partnership of convenience and escalates in a bloodbath. Husband and brother become deadly enemies, and the woman is caught up in between two fronts whose characteristics constantly change, until in the end, no one knows on whose side he is. Swiss writer, born in 1984, grew up in Bosnia and Herzegovina, as well as in Sweden. Since 1993, she has been living in Winterthur, Switzerland. In 2005, she began to study German language and literature at Zurich University, and since the fall of 2007 she’s been studying creative writing at the Academy of Fine Arts in Bern, in a cooperative programme with the Swiss Literary Institute in Biel. Yellow Days was developed in 2005/6 during “Dramenprozessor” at Theater an der Winkelwiese Zurich, where Janjic frequently worked as assistant director. In September 2006, the play was presented during the fourth “Wochenende der jungen Dramatiker” (weekend of the young dramatists) as a staged reading at the Münchner Kammerspiele. In summer of 2007, Daniela Janjic was a participant at the festival “World Interplay” in Townsville/Queensland, Australia. In 2010, Janjic won Carl Heinrich Ernst Art Prize for Literature, and won the IBK Award Dramatic Texts in 2016. Egyptian theater director, graduated from the faculty of Arts – Ein Shams University. Sanad directed several plays including “Macbett” for Romanian-French playwright Eugene Ionesco, and produced by El Hanager Theater; Macbett participated in Carthage Theater Days Festival in 2013, and won the best team award at the Fez Festival of Theater in Morocco (2014). Sanad also directed “The Dumb Waiter” for British playwright Harold Pinter, which was produced by the Theater Art House. Sanad is known for his contemporary vision of stage clothes, movement, decor and music to present his art in a simple way that attracts all audiences.